Funny which memories we keep 'N discard, as this story stayed with me since I was so enthralled that I actually hand-wrote I-T 20yrs ago in cursive; Y'all remember that cryptic language, right? As this was a time before I'd been introduced to the Personal Computer, along with still having relatively decent vision - since I still had a Driver's license and could actually S-E-E 'N recognize A-L-L of the various exotic cars on hand and on the roads. Finally finding shelter in a parking garage, we walk over to the bar where his dad has been awaiting our arrival. The Great American Sports Bar is quite the place, with enough big-screen TV’s standing ready to show every Sunday (NFL) football game simultaneously. The remaining wall space is adorned with an impressive smorgasbord of sports memorabilia. Framed football jerseys of Joe Montana, Ronnie Lott and Dwight Clark along with framed autographed pictures, game balls, etc filling the space. Leaving Marcus at his Dad’s in San “Hose” as the locals call it, I’m off on a solo journey to parts unknown… Aiming for Carmel, California, part of this weekend’s Monterey Historics exotic automobile Mecca, as Marcus's father has told me how the local's would get there from his Apartment. Reaching the top of the hillside’s ridgeline, I’m greeted by clear skies while the Pacific ocean’s brilliant blue green waters beckon in the distance. Sitting in traffic, a yellow Ferrari 330 GT convertible and two trucks pulling trailers pass by; leaving me wondering just what exact type of exotic machinery are inside those trailers, eh? Crawling uphill towards the end of Highway 1, I notice the exit sign for the “famed” 17 mile drive to Pebble Beach on my right side. Nearing the first city stoplight of Carmel, I hear the unmistakable rumble of a flat 12 boxer engine as a Ferrari Testarossa and Porsche Speedster pass me. This MUST be the right direction after all, eh? Following the never ending line of cars, I arrive at Quail Lodge golf course one hour later, this being the worst of the traffic to date upon my trek to Carmel! Following the traffic to the awaiting parking attendants, I’m asked if I wish to pay the $15.00 parking fee or park for FREE? (DUH!) Thus after parking the “Chebbie” out-of-site in the nearby residential neighborhood. Walking towards the golf course I realize that I’m laughing to myself! (Giddy Schoolboy laughter) With the journey seeming to have already “paid” for itself as I pass five Ferrari’s, two DeTomaso Pantera’s, a Maserati and Acura NSX ALL in the FREE parking; Aye Karumba! Nearing the car show entrance: “Pardon me, Do you have any Grey Poupon?” Err, I mean jumper-cables, eh? I watch bemused while waiting to hear the sweet sounds of a stillborn Lamborghini Countach V-12 engine reluctantly roar to life. I pass a Ferrari Daytona coupe and another Testarossa, as there's FREAKIN' Ferrari’s Everywhere! And that's before I've even gotten into the show; Mama Mia! Entering Concourso Italiano’s main gate, I’m simply “AWESTRUCK!” This is the largest, most awesome gathering of Italian Supercar’s I’ve ever witnessed in my life; “Momma Mia!! !” Never before have I seen so MANY Ferrari’s, as there’s row after row of assorted colours. For starters: Daytona’s, Dino’s, 250/275 GTB’s, F-40’s and Testarossa’s abound. 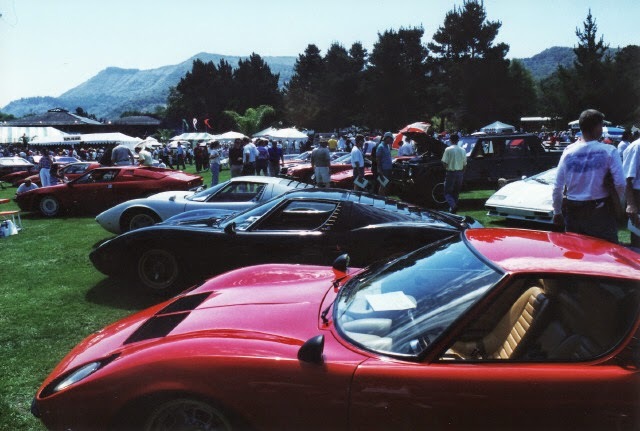 Then the 'BAD BOYZ:” A 288 GTO, a 512Bbi, a 512BB Le Mans racer, a trick 348 Challenge car, a 250 GTO and an awesome 1983/84 Lancia twin turbocharged Ferrari V-8 Le Mans prototype. (825bhp @ 1.7bar) As this car reached a terminal velocity of 246mph on the Mulsanne straight! Next it’s over to “Lambo-valley,” where I’ve never seen this multitude of Lamborghini’s at once! 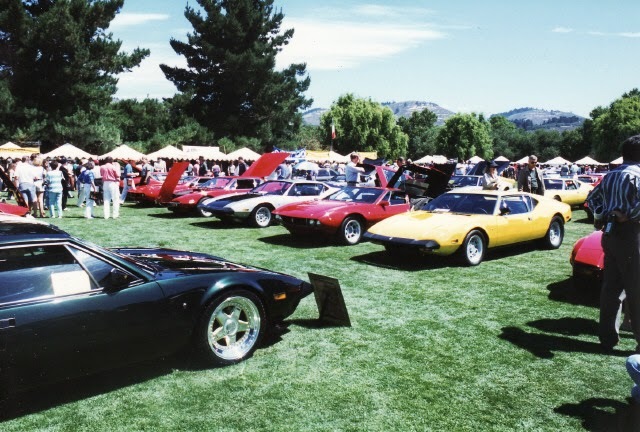 Sprinkled liberally about, sit at least 15 Countach's, a few Diablo’s plus a Diablo VT, And the MOST AWESOME Lambo: four Miura’s, 5-10 Jalpa’s along with the ugly duckling Espada’s. After sheepishly buying 2 T-shirts & related “trinket,” I walk over to the Ford Ghia display tent to look at the Ghia concept cars. As there’s even a mock-up modular Aston Martin V-12 engine on display. I walk over to the crowd of people surrounding a brilliant blue Bugatti EB110, making it’s North American debut. Yes it’s the same car that Michael Schumacher would pirouette several times in the rain while giving a “hack” (journalist) a test ride aboard his brand new “toy. Next I meander over to the main grandstands where the stage “drive-by’s” occur. This activity is supposed to begin around 1-1:15PM, but Italian’s love their pasta and nothing will hasten the leisurely lunch. The mood is complete with an Italian opera singer and several fine lambrusco’s to clense the pallet. The procession of vehicles to drive past the awaiting spectators begins at 1:45PM. After soaking in some afternoon sunshine and fine Italian beverages while admiring passing Italian coachwork from the grandstands, I make another circuit to view all of the various marques one last time before departing. Exiting the show, I saunter over to the “back-forty” (preferred parking lot) where a small armada awaits perusing, as I’m floored, as a sea of red Ferrari’s stretch as far as the eye can see! Ferrari 308’s & 328’s seem simply “A dime-A dozen,” with Daytona’s, Testarossa’s and Dino’s sprinkled in for variety. I saunter by multiple 348’s, four Pantera’s and a lone red Dodge Viper; CRIKEYS! Departing Quail Lodge, I set off to check into my motel in nearby Marina del Ray via traffic choked Carmel. Snaking along, I’m passed by three Pantera’s with three Testarossa’s trying to catch up! I continue walking with the wondrous symphonic melody of the Lambo's V-12 playing in my head until reaching a large park overlooking the Pacific Ocean. (Lover’s Point) Thinking I’ve obviously passed Cannery Row, I turn around and begin walking along a wonderful trail beside the ocean. Taking Ocean View blvd past the aquarium and the shops along Cannery Row, I realize that I've’ been walking for nearly 3-hours... Then panic sets in as I’ve momentarily forgotten where I parked the Chebbie; SHEISA! After spending another 30-45mins searching for the non-descript white 2-door Chevrolet, I flee Monterey to return to my motel! 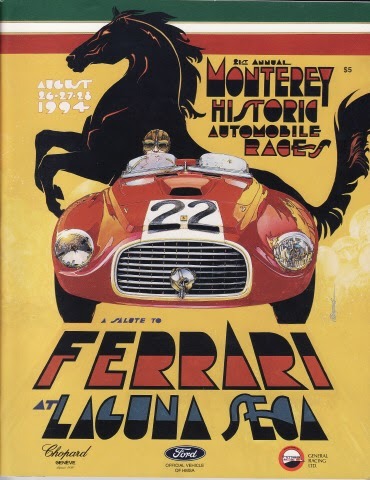 To continue reading, see; RETRO:Monterey Historics1994 - 20yrs later - Fini!